Since the 1920s buses and bus companies have been a strong focus of attention. Recent changes to long-established bus routes and traffic congestion in Banbury have once again become the subject of heated arguments over the best use of public transport. Now is a good time to recall some features of the market town that made it so distinctive and how bus transport in the days when few people owned cars was an important factor. Older readers amongst those familiar with this column will recall that Stagecoach was preceded by the Birmingham and Midland Omnibus Company. Many passengers would alight in the High Street to be close to the main shopping area and in a significant number of instances their requested destination would be Judges, even after this remarkable fashion store had long since ceased to exist. Memories of how it served the town masked the fact that Curry’s electrical had taken its place. In 1950 the issue of a purpose built bus station found news space in local and national newspaper columns. For instance on Thursday April 27, page six of the Daily Graphic carried a banner headline, ‘Why Banbury’s Cross’. 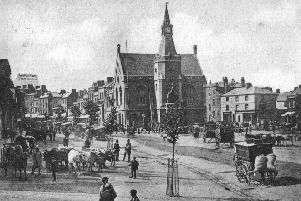 The story by Neville Randall, with accompanying pictures taken by William Barrett, revealed the town was trying to cure congestion in the Cow Fair [Bridge Street nearest the Town Hall] by persuading Inland Waterways to release three acres of wharfage which was underused because less coal travelled to Banbury along the Oxford Canal. Local traders, civic and Midland Red voices were all raised in support of a bus station on the idle acres. Mr EC Kingerlee spoke of custom departing the town, Mrs Mary Cheney bemoaned long waits in pouring rain whilst shopping got soggy and Mr FJ Hands, Midland Red traffic superintendent talked about a problem since 1935 and the fact that in 1919 there were hundreds of cows but two buses in the space east of the town hall and in 1950, only a few beasts but 500 buses coming and going daily. It took another 11 years before reporters locally could announce a Banbury bus station model had been approved by the borough council. A further six years elapsed before in August 1967 there appeared a photograph of the new structure being erected by Brackley Builders. Then almost unbelievably came the November 22 headline, ‘New Bus Station may have to close! 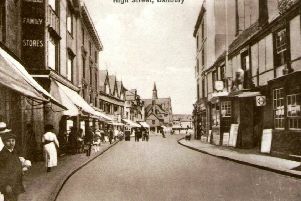 Victim of the 41,000 plan for Banbury’. Worse news was to follow in 1971 when newspaper headlines warned of the possible closure of the Midland Red garage. However not all news was bad in the fifties, sixties and seventies. A new service B14 was to link Banbury and Overthorpe via the Causeway. Excursions reflected changing horizons and fashions for travel, typically a trip to the Spring Festival at RAF Heyford. Come 1976 and service X59 linked Coventry with Oxford via Banbury. On Thursdays (market day) especially numerous village buses could be seen on the bus station forecourt. Public concern was voiced once again in September 1991, this time in the Banbury Guardian by Mark Wiltshire who revealed that over 700 people had signed a petition to save the bus station and especially the café from being demolished to make way for a new shopping centre, Castle Quay. Café proprietor Tex O’Neil spearheaded the protest. He was concerned about the prospect of fewer people visiting the town and also discrimination against elderly bus travellers. His views were shared by not so elderly Julie Leach from Surrey who visited her mother in Bretch Hill. She added ‘when you have been on a hot bus it’s nice to come in to the café for a cool drink’. A spokesman for Banbury Shopping Centre Limited stressed that the main pick-up point would be Bridge Street close to the shops. He was quick to add that the new bus station would not be too small.